Receive a Complimentary Consultation for mini-implants! Mini-implants stabilize dentures so you can smile and chew with confidence. What Are MDI Mini Implants? Dr. Little uses the MDI Mini Implant System. The MDI System consists of a miniature titanium implant that acts like the root of your tooth and a retaining fixture that is incorporated into the base of your denture. The head of the implant is shaped like a ball, and the retaining fixture acts like a socket that contains a rubber O-ring. The O-ring snaps over the ball when the denture is seated and holds the denture at a predetermined level of force. When seated, the denture gently rests on the gum tissue. 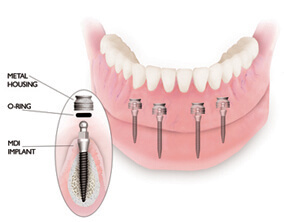 The implant fixtures allow for micro-mobility while withstanding natural lifting forces. Dentures no longer have to be uncomfortable, loose fitting, noisy and difficult to eat with. Many, if not most, denture wearers have difficulty dealing with the way an upper denture fits ... and feels in their mouth. A reflexive gag response is not uncommon. Mini dental implants are very effective for a lower denture. For the upper arch, we recommend traditional implant placement. This enables many patients to have their denture trimmed, getting rid of the acrylic portion that covers the roof of the mouth. Similar to a fixed bridge, an Imtec supported upper denture can provide the comfort and confidence that a fixed bridge provides. Dr. Little provides a wide variety of tooth replacement technologies that incorporate the use of mini implants. Mini implants, because of their inherent design features and size, eliminates the need for time consuming bone grafting procedures which typically require several months of healing that integrates the implant with the jawbone (process of osseointegration). Patients with special circumstances regarding current tissue health and the appropriateness of implant surgery are invited to contact Dr. Little for assistance in obtaining the information needed for making an informed treatment decision.